Is your home town changing colour? LEDs are the new in-thing for lighting up our nights, promising to save authorities money, lessen maintenance costs and offer a shortcut to the smart, connected city. The problem is there's little awareness of how poorly-designed LED lighting could have a potentially devastating effect on privacy, human health, scientific research and the natural world. So is it time we all got to know LED lighting better – and are the standards high enough for our so-called smart cities? LED street lights are quickly changing how our streets look, but they're also being used to help create smart cities. 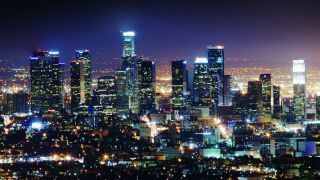 Los Angeles recently became the world's first city to deploy Philips connected street poles, which also act as 4G LTE cellular towers, and Doncaster in the UK just got 33,000 wirelessly connected LED street lights that use a pioneering low-power, wide-area and ultra-narrow broadband wireless technology to effectively turn each lamp post into a router. This means it's likely we'll soon see LED street lights equipped with CCTV cameras, Wi-Fi routers and digital signage. They'll be armed with multiple sensors that monitor air quality, hyper-local weather, traffic flows, nearby parking spaces, footfall on pavements and sidewalks, and noise pollution. While sensor-packed LED street lights might bring lots of benefits, they come with huge concerns over their incessant collection of data. Does anyone really want a sensor tracking their phone or wearable device, perhaps recording their heart-rate as they pass an LED street light? Or even our conversations? That tech will soon be here, with ShotSpotter systems – gunshot detection or microphones on street lights – already being considered. "Intelligent street furniture is not the first example of a connected city – services such as CCTV and emergency response systems are designed to increase public safety, but can be seen by some as 'Big Brother'," says Jon Scott, product development manager at Marshalls, which specialises in LED street lighting and smart street furniture. It's all a question of balance: citizens need to know what their data is being used for, and why. "Anonymising user data is a good first step in helping to limit the ability for any one user to be tracked through a system and specifically identified," says Scott, but he thinks that another option might be to explore the use of physically separate devices. "Standalone Bluetooth tags would ensure the data required to interact with a smart city is held separately from sensitive data held on an individual's mobile phone or other device," he adds. "The trade-off is that individuals will enjoy less personalised support from the smart city itself." Another issue is that LED street lights are being installed on the cheap. They may have the potential to be at the core of smart cities, but for now they're being clumsily installed without either knowledge nor consultation, and could be storing up health problems for all of us. White LED street lighting is more energy-efficient and longer lasting than the orange high-pressure sodium lights they're quickly replacing, but it comes at a cost that's beyond financial. The first is glare; the new LED street lights make it harder to see anything in the shadows thrown by cars and trees. The second is that badly chosen LED street lights create a clinical white light. "A common complaint of LEDs is that the light they produce is 'cold' or unwelcoming, and there's actually a strong evolutionary reason for this," says Scott. "We've evolved to associate warm red/orange light from natural sources, such as the setting and rising Sun and firelight, as being associated with dawn and dusk, which are generally times of rest," he adds. "But our brain recognises blue light – which is also emitted from TVs, mobiles and computers – as daytime, and too much of it can knock our natural body rhythm out of sync." LEDs contain a lot of blue light, which has negative effects on human health (as well as the health of birds, turtles and insects) according to the American Medical Association, which says that white LED lamps have five times greater impact on circadian sleep rhythms than the lamps they replace. Everyone knows about the need to stop staring at tablets and phones an hour or so before bed time (blue light suppresses melatonin production at night), with brands like Apple and Samsung baking the ability to gradually change the light emitted from LED screens to warmer, less harmful hues into their devices. "The blue light produced inside the LED is changed to white through the use of phosphor coatings, which absorb some of the light energy and convert it into a warmer yellow light," says Scott. It's the mixture of yellow and blue that creates the light, which we perceive as white. "The conversion process isn't 100% efficient, so colder lights – where less blue light is converted – are more efficient than warmer yellower lights," he adds. The amount of blue light we're exposed to is becoming more controllable, so it's easily possible to achieve a balance between lights that are highly efficient and lights which are pleasing to to the eye, and less harmful – it's just a matter of whether authorities believe there's a real cost-benefit in using them. "The new World Atlas of Artificial Sky Brightness showed that about 70% of the land area of the USA is in a state of perpetual twilight at night, never reaching natural levels of darkness," says John Barentine, Program Manager at the International Dark-Sky Association (IDA) in Phoenix, Arizona, and author of The Lost Constellations. The main problem is, again, the blue light produced by current street lights. "White LEDs are the number one problem that's facing us," he says. Anyone looking at Nasa's Blue Marble image can see that it's already a big, big problem – the world glowing brighter every night. One of the biggest movements for dark skies in the US is centred on Flagstaff, a certified Dark Sky Community that has long fought to keep its skies dark. It has a tangible reason to do so, since on Mars Hill, barely half a mile from the centre of town, is the Lowell Observatory, where Pluto was discovered in 1930. Retired astronomer Christian Luginbuhl at the Flagstaff Dark Skies Coalition published a research paper in 2014 which showed that if you switch from high-pressure sodium to white LED, the 'sky glow' will increase tremendously – even if you match the total number of lumens (the brightness thrown out) of light. "That was an eye-opening moment," says Barentine. "It showed that even when cities converting to the new LED technology do what we think is a good thing – by not adding more light in terms of quantity – they still end up with more sky glow." The issue is that white LED systems emit a lot more shortwave light than high-pressure sodium, which is narrow-band. Sadly, shortwave light scatters. It doesn't have to be this way and, as usual, technology does have an answer. Even progressive Flagstaff needs to take advantage of LED's undoubted economic benefits, but unlike most towns it's not rushing in and buying the cheapest LED solution without first trying out night sky and eye-friendly alternatives already on the market. Together those technologies largely solve the problem of sky glow, while also achieving the same low electricity costs, but they're newer, so don't have economies of scale. "The cities of the world in the next few years are going to get brighter – as seen from the ground and from space – as a result of these conversions," admits Barentine. The result? The planet is more than twice as bright as it needs to be if solutions aren't found. That doesn't need to be the case, and perhaps – just perhaps – it won't. LED fixtures are so small that the distribution of light can be carefully controlled, with proper shielding minimising spill. "This more precise light distribution means we are able to reduce the impact on local wildlife, especially nocturnal hunters such as bats, and also cut back on sky glow," says Scott. Marshalls has developed M-LIVE technology that creates intelligent street furniture that's able to control lighting. "It allows light levels to be tailored to the requirements of nearby users through the use of proximity sensing technologies, including motion sensing and wireless communication systems, such as Bluetooth," Scott adds. Street lights will therefore switch on only when they sense a smartphone coming their way. Now that's efficiency. So it's clear what's needed to stop this trend: properly shielded, filtered LED lights that emit warm light, dim when no one is around. But there will need to be strict controls on both the light output and on what happens to data collected by sensors on networked LED street lights, too. While the new technology is saving money and helping reduce energy usage, there's a definite need for more research into what the technology will do and how it can affect society at large – both mentally and physically. Authorities need to start delivering carefully planned and controlled LED street lighting, realising that it has the potential to change our cities for the better over stock white LED systems – even if those offer the cheapest route to making our lives more connected. Connected homes are less scary – and they're pretty awesome too.